Well I don't have swatches up of anything I bought there yet, lol, but I wanted to highlight my adventure last weekend at Beauty 360. It's a division of CVS, in fact they're attached and you can enter one through the other, though they couldn't look anymore different. 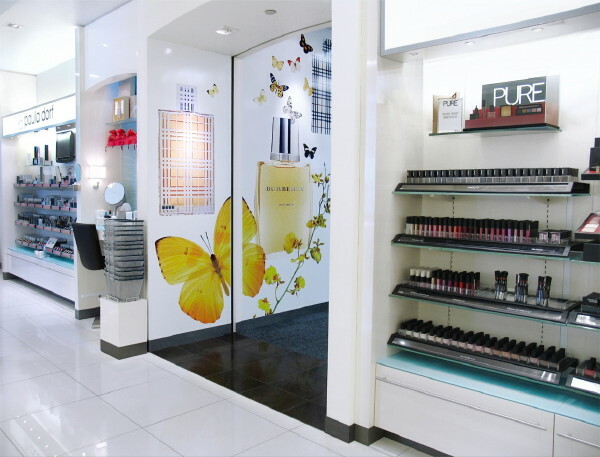 Beauty 360 has the high end makeup store look of Sephora, with a lot of bright lights, mirrors, and applicators for testing. But what turned out to be the biggest selling point of the store to me is that Beauty 360 has a lot of brands that you can't get at Sephora: Pixi, Cargo, Laura Geller, Mario Bedescu, etc. There turned out to be quite a few products available for swatching that I only saw online, or in YouTube videos, and I appreciated CVS making them available. Thought available might be considered a bit of a stretch as full blown Beauty 360's are only at a few CVS's in the entire world. I'm just lucky enough to be living in DC, which has one located in Dupont. As far as the staff goes the ladies were very nice, one was able to help me look around for a good purple eyeshadow, though they don't seem quite as knowledgeable as the reps at Sephora. I had one sales associate giving me a recommendation for a Cargo foundation after saying 'Well you're lighter than me and I use..' when if anyone had looked at us next to each other I would definitely have won the pigmentation contest. Whenever you're iffy at Sephora the people I've interacted with are more than ready to help me out with an in store test, which I consider very helpful. I didn't end up asking for a sample of the foundation I was considering, so unfortunately I can't tell you Beauty 360's stance on that. Overall I enjoyed my experience a lot and in comparison to other high pressure sales situations I appreciated the freedom to go around and touch and test with no interruptions. I even ended up doing my friends entire eye look for the evening from the Cargo testers available and no one gave me any grief. I'd definitely go back and with Beauty 360 having the same return policy on cosmetics as CVS (can return within 30days as long as you have your receipt), I think it's a great place to visit if you're unsure about your purchase.